Videos of TV Interviews, Floor Speeches, and more can be viewed on Rep. Roberts’ YouTube Channel. After many months of negotiations and many hours of debate on the House floor, the House passed a balanced 2019-20 budget for the state of Colorado. You can read a detailed summary of the full budget here. This balanced budget is something we can be proud of and one that has significant resources dedicated to Eagle and Routt Counties (and all of Colorado). Read my summary of the state budget in my latest newsletter: CLICK HERE. This morning, the House Rural Affairs and Agriculture committee unanimously approved a bill address the high costs of healthcare in Colorado. The bill is sponsored by Western Slope Representatives Dylan Roberts, D-Avon, and. Julie McCluskie, D-Dillon. Presenting SB4 with Rep. Julie McCluskie in the House Rural Affairs Committee. SB19-004 will strengthen Colorado’s laws to allow healthcare cooperatives to incorporate consumer protections like coverage for preexisting conditions. It will also allow the State Insurance Commissioner to work with groups seeking to create co-ops so that they can get their co-op up and running as soon as possible. The bipartisan bill will help lower healthcare costs by encouraging consumers to negotiate rates on a collective basis directly with providers and offer plans to individuals, business, and other groups that are more affordable than what currently exists on the market. Senator Kerry Donovan, D-Vail, is the Senate sponsor of the bill. The Senate approved the bill on a bipartisan vote of 34-to-1 earlier this month. SB19-004 now goes to the House floor. The House Education committee approved a bill sponsored by Rep. Dylan Roberts, D-Avon, and Rep. Dominique Jackson, D-Aurora, that would help prevent fraud and misconduct, and improve transparency on student loan servicers. This bill would include student loan servicers in the Uniform Consumer Credit Code to establish licensing requirements for these service providers. It also empowers the Colorado Attorney General’s office to field, review, and attempt to resolve any complaints by borrowers against service providers. Making progress on lowering health care and insurance costs! The Denver Post recently summarized the 8 ways Colorado lawmakers want to make health care cheaper. 3 of the 8 efforts are Rep. Roberts’ bills: public option, reducing insulin prices, and health insurance co-op authorization. April legislative newsletter from the Capitol and HD26: CLICK HERE. Town Hall Meeting in Hayden. Thank you for a great town hall meeting, Hayden! Remembering longtime firefighter and dearly loved family man who lost his life in CDOT accident in Eagle County via Vail Daily. DENVER – The House Health and Insurance committee approved Rep. Dylan Roberts’ bill to reduce the price of life-saving insulin for people with diabetes in Colorado. Over 420,000 Coloradans have diabetes and an additional 20,000 Coloradans are diagnosed with diabetes every year. HB19-1216 caps the total co-pay that patients will pay for insulin to $100 per one-month supply, regardless of how much insulin is being dispensed. This is down from an average out-of-pocket costs of $600-900 per month, which Coloradans currently face. “This bill is a targeted and modest step at trying to solve the much larger problem of prescription drug pricing but it will make a huge difference for Coloradans with diabetes and their families,” continued Rep. Roberts. The bill also directs the Colorado Attorney General’s office investigate business practices, organization, pricing, and data of pharmaceutical manufacturers, pharmacy benefit managers, insurance carriers, and any other entity that influences insulin costs and create a report that explores possible legislative solutions. The report will be submitted to the governor, the commissioner of insurance, and the judiciary committees of the House and Senate in 2020. Town Hall Meeting in Gypsum! Thanks to everyone who came out for a great discussion in Gypsum! Sponsored by Rep. Dylan Roberts, D-Avon, the Winter Conditions and Traction Control Requirements bill (HB-1207) passed 46-18, with five house Republicans joining Democrats in voting for the legislation, which now heads over to the Colorado Senate for deliberation. "As I-70 drivers, we all know why this is important," Roberts said. "When the road up to Vail Pass or the Eisenhower Tunnel is snowy enough, it turns into chaos up there and just totally shuts down the highway. A lot of times as you drive by, you see all these cars spun out who clearly don’t have the right tires and were not prepared to be traveling that stretch of road that day." HB-1207 requires that all motor vehicles traveling on I-70 between mileposts 133 (Dotsero) and 259 (Morrison) from Sept. 1 to May 31 be equipped with tires that have at least three-sixteenths of an inch of tread (up from the current two-sixteenths) or tire chains or alternative traction devices such as AutoSocks. "(Spun-out cars and SUVs) have a choking effect on our entire highway system and our local residents as well as any tourists who are not going to come up to our county anymore and spend their money because of how miserable the traffic is," Roberts added. Full Article in the Vail Daily. March newsletter, legislation updates, and upcoming town halls: CLICK HERE. February newsletter, legislative update, and town hall calendar: CLICK HERE. As a bipartisan bill aimed at establishing a public health insurance option for Coloradans makes its way onto the House floor, Rep. Dylan Roberts (D-Avon) is feeling confident about support from the Senate and the Governor's office. The cost of health insurance is exceptionally high in Colorado, Roberts said, with the mountain counties he represents having some of the highest premiums in the entire country. "I talk to people all of the time who are choosing to forgo health insurance because they need to pay their mortgage," Roberts said. And as premiums have skyrocketed during the past decade, so have deductibles. According to the Colorado Health Institute, deductibles rose 65 percent between 2010 and 2017. Co-authored by Rep. Marc Catlin, (R-Montrose), HB19-1004 sets out the process to create a public option, Roberts explained. "This bipartisan bill is a uniquely Colorado solution to a big problem we have in our state," said Roberts in a news release. "Too many Coloradans, especially in rural Colorado, are paying too much for health insurance." Full article. Legislative update newsletter and town hall calendar: CLICK HERE. Legislative preview newsletter from Rep. Roberts: CLICK HERE. Local lawmakers Kerry Donovan and Dylan Roberts tabbed to lead state legislature committees via Vail Daily. DENVER — Eagle County's two state lawmakers landed on committees near their constituents' hearts. Sen. Kerry Donovan and Rep. Dylan Roberts received their committee appointments this week, as they and the rest of the state's lawmakers gear up for the 2019 state legislative session. • Donovan will chair the state Senate's Agriculture and Natural Resources committee. • Roberts will chair two committees: the Rural Affairs Committee and the Capital Development Committee. THANK YOU EAGLE COUNTY AND ROUTT COUNTY! A Medicaid Buy-In aka a "Public Option"
You can learn more in this story in the Steamboat Pilot about this exciting bill: CLICK HERE. CLICK HERE to read about what I and my team have been up to during the summer. Six Roberts bills signed into law, an appearance on VICE News, interim committee work, and more! It's all in Rep. Roberts' June newsletter: CLICK HERE. Quintin's Amendment Signed Into Law! Quintin Lovato of Gypsum meets Governor John Hickenlooper after the Governor signed into law HB1286, a bill named after Quintin. GYPSUM — Monday, June 4, was 9-year-old Quintin Lovato's best day ever. First, Gov. John Hickenlooper signed into law Quintin's Amendment, which will make life easier for Quintin, his family and hundreds of other families around the state. Continue reading the Vail Daily article about Quintin, the bill, and what it means for Colorado: CLICK HERE. Now that the session has concluded, I am hitting the road to hear from you. Please join me at one of my town halls across House District 26. CLICK HERE for full details. Roberts named one of the "Fabulous Five" Legislators by Conservation Colorado for his work at the Capitol in 2018. "He got off to a great start with a focus on protecting our water, advancing rural economic development, and preserving our unique landscapes." Read more: CLICK HERE. The 2018 Legislative Session has come to a close! CLICK HERE to read my May Newsletter where I recap some of the big bills that passed at the end of the session, including transportation spending and PERA reform. You can learn more in my Vail Daily Op-Ed about this exciting bill: CLICK HERE. Quintin's Amendment passes the House! Vote count on HB1286. It passed with a large bipartisan majority. Another bipartisan bill passed! House Bill 18-1286 aka Quintin’s Amendment will allow children who rely on medical marijuana for conditions like epilepsy, Chron’s disease, and so many other conditions to have access to that medicine while they are at school. Letting these kids live as normal lives as possible and relieving the burden on their families is a cause I’m proud to champion. On to the Senate with a huge bipartisan majority vote from the House. Vail Daily: Rep. Dylan Roberts, D-Eagle, has introduced a bill he says will help make sure maintaining water quality is a priority, even after hard-rock mines shut down. "Every day at the Capitol before I sponsor or vote on legislation, I always ask, "How will this make people's lives better?" I was proud to sponsor the Arbitration Service Provider Transparency Act that has now passed through the House because it does just that — helps make everyday consumer's lives better." Read the full op-ed about one of my bills, the Arbitration Provider Transparency Act that has successfully passed the house: CLICK HERE. House Bill 1009, sponsored by Rep. Dylan Roberts, D-Eagle, would require pharmaceutical companies, pharmacy benefit managers, insurers and nonprofits to make more information available on insulin pricing, including production costs, annual profits, and wholesale costs. 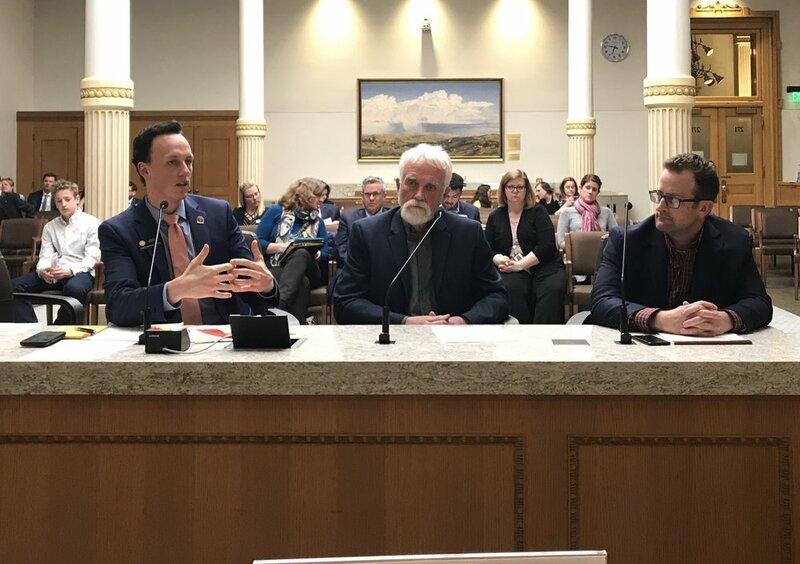 Colorado lawmakers on Tuesday took a step toward preventing future mining disasters through the introduction of House Bill 18-1301, a bill that will ensure that water quality and cleanup is a top priority in the issuance of new hard-rock mining permits. "Water's our most valuable resource. Protecting our water is always an effort we should undertake in the legislature," said Rep. Dylan Roberts, D-Eagle, a bill sponsor. "This year, our water supply could be very scarce and making sure that water is clean is of huge importance." Read the full Denver Post article: CLICK HERE. Two bills by Rep. Dylan Roberts to boost rural Colorado advanced in the House today. 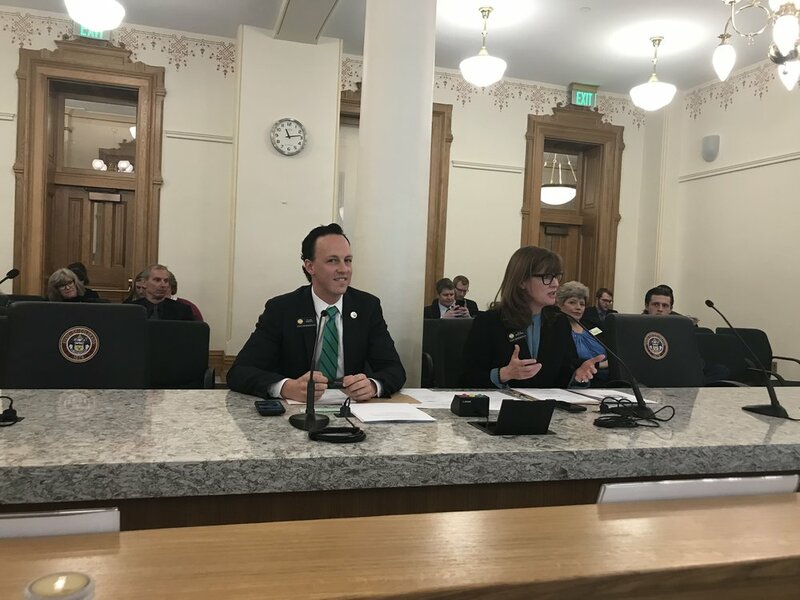 This evening, the House Health, Insurance & Environment Committee advanced HB18-1205, Rep. Roberts’ bill to reduce the disparity in health care costs between rural Coloradans and those on the Front Range. Rural Coloradans pay significantly higher health insurance premiums and the burden is heaviest on rural Coloradans whose incomes fall between 400 percent and 500 percent of the Federal Poverty Level. Read the full release: CLICK HERE. Rep. Roberts presents HB18-1205 to the House Health Committee with County Commissioners Wheelock (Clear Creek) and Cimino (Grand). The bill will help rural Coloradans who face increasing health insurance costs. It passed the committee on March 8, 2018 and heads to the House Appropriations Committee before a full vote on the House floor. CLICK HERE to read about Rep. Roberts' bills and other work at the Capitol. Rep. Roberts hit the road in February and held coffees and town hall meetings across the district. Events were held in: Avon, Basalt, Eagle, Hayden, and Steamboat. Town hall with State Rep. Millie Hamner in Basalt, Avon Town Hall, Ski Jouring in the Steamboat Winter Carnival Parade, Steamboat Town Hall. "Rural DA bill sponsored by Rep. Dylan Roberts passes 1st committee" Read full article: click here. Rep. Dylan Roberts (D-Eagle) presents HB 18-1102 with co-sponsor, Rep. Cole Wist (R-Centennial) to the House Judiciary Committee. The bill to extend a rural prosecutor fellowship program passed the panel on a 9-1 vote. "I write today to provide an update on what has happened in the first month, what I am working on for you and what to expect in the month ahead. A lot has happened in the month since the session began. We have already sent a law to the Governor's desk that will allow nurses to practice across state lines and fixed a tax code that will benefit our local special districts that provide public transportation, fire protection and other services." Read the full letter in the Vail Daily and the Steamboat Pilot. CLICK HERE to hear about the start of the 2018 legislative session and learn about Rep. Roberts' work at the Capitol. Honoring Eagle County and Routt County's Olympians on the House Floor. There are twenty-one athletes with connections to HD 26 heading to South Korea to represent us in the 2018 Winter Games! Go USA! Rep. Dylan Roberts listens to remarks by House Speaker Crisanta Duran on the opening day of the 2018 Colorado legislative session. CLICK HERE to see what Rep. Roberts will be working on and see how you can stay in touch throughout the session. Freshman Rep. Dylan Roberts hasn't even started his first Colorado House session and has already introduced a bill that could help Colorado families struggling with diabetes and the cost of treating it. Read the full article in the Vail Daily here. When Lawmakers reconvene in Denver for the General Assembly session in January, one of the many topics up for debate will be the cost of insulin. CLICK: Full article with video story. Inspired by a Nevada law that takes effect Monday, state Rep. Dylan Roberts, D-Eagle, plans to introduce legislation when the Colorado General Assembly convenes next week to require transparency about insulin pricing from drug manufacturers. “If you have Type I diabetes, you cannot live without insulin, and it’s one of the prescription drugs whose price has increased exponentially over the past several years,” Roberts told Colorado Politics. The House Democratic caucus gained a new member today with the swearing-in of Rep. Dylan Roberts to represent House District 26. He succeeds Rep. Diane Mitsch Bush, D-Steamboat Springs, whose resignation became effective Nov. 2.